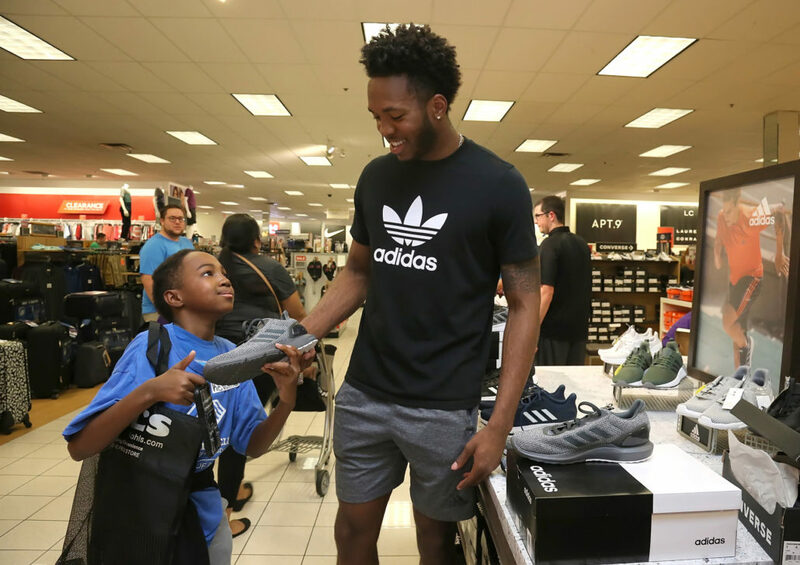 SCOTTSDALE, ARIZ (July 24, 2018) – On the first day of four back to school shopping days sponsored by community leaders Ellie & Michael Ziegler, 220 Boys & Girls Clubs of Greater Scottsdale (BGCS) kids, selected by need, shopped for new clothes and shoes at the Desert Ridge Kohl’s. Mom of 10-year-old Taliyah and 9-year-old Amirah, Chavez is also foster mom to four children ranging in age from infancy to teens. Chavez’s children have attended Boys & Girls Clubs of Greater Scottsdale’s Hartley & Ruth Barker Branch in south Scottsdale since August 2015. Taliyah, Amirah and 11-year-old Alazia shopped at today’s Prep Rally. Each child is allotted $100 and paired with a community volunteer who serves as a shopping chaperone. Backpacks filled with school supplies provided in partnership with Assistance League of Phoenix and the Legacy Foundation were also distributed to each child. An additional 250 youth and teens from BGCS will shop later this week, including members from the Peach Springs Branch who will go to the Kohl’s Flagstaff location. To add to the excitement of the day, Arizona State University Men’s Basketball Coach Bobby Hurley and his 2018-19 team were on hand at the kickoff event with a message of inspiration. Prep Rally relies heavily on community and corporate engagement, as each child is paired with their own adult volunteer including representatives of the Arizona Coyotes, Big YAM, Charles Schwab, GoDaddy, Sons of Arizona, Sunland Asphalt, TopGolf and Voya Financial. The Zieglers have invested their time and more than $500,000 over six years to help outfit and prepare thousands of kids for school.